While a box spring is traditionally placed under a mattress to offer support for both the mattress and those resting upon it, it's not necessary. Any structure that keeps a mattress flat and sag-free does the job, including platform bed frames or wood-based bed foundations. On the inside, box springs traditionally have a series of metal springs or coils built inside a lightweight wood frame. This structure is covered with fabric that matches a mattress; the box spring may be sold as part of a set with the mattress. It offers both support and ventilation for the mattress atop it. In some cases, a mattress warranty requires that the mattress is used with a specific box spring to ensure mattress longevity. Some mattress stores sell mattresses with a bed "foundation" instead of a box spring. In some cases, these foundations look a lot like box springs. The difference is in the construction: The inside of a wood foundation looks a bit like a mattress-shaped wood pallet, made from durable wood planks. Like a box spring, a foundation with wood on the inside offers both support and ventilation for a mattress. A platform bed is designed for use without a box spring and can be used with most mattress types. Instead of a traditional metal bed frame that's made to hold a box spring, a platform bed has its own support system designed to hold the mattress. Many platform beds have a series of parallel wooden planks that will support a mattress or even a futon mattress. These planks may be attached to a strip of durable webbing to keep them evenly spaced. This type of base allows ample airflow to the mattress so it doesn't retain moisture or develop stale odors. Make your own fun, funky base for a mattress out of legally purchased plastic milk crates. The typical 16-quart milk crate holds 35 pounds, so a series of them makes a great sturdy bed base. Position crates upside down, or use them sideways with the openings facing out to add storage space for slippers or electronics. Connect the crates together with zip ties, using as many crates as needed to make a solid base structure for your mattress size. Cut a piece of plywood to fit the top, then set the mattress atop the plywood. Be sure to wear safety goggles while cutting the plywood. Secure the plywood to the crates with small bolts and large washers secured through the crate up into the plywood. The washer helps stop the bolt from pulling through the wood. A milk crate bed base is a great option for a tight space or an upstairs apartment where fitting a box spring up a narrow stairwell is difficult. Instead of using full sheets of supported plywood as a bed base, make your own slat structure, designed to fit a regular metal bed frame, out of 1x6 boards. 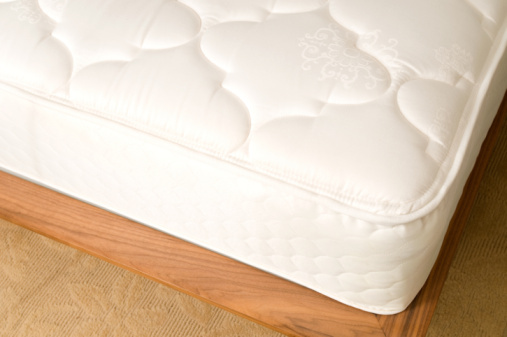 A slat base allows proper ventilation and support for the mattress. Measure the width from side to side and from the head to the foot of the bed inside the "tray" of the frame that's designed to hold a box spring. Purchase enough wood to fit the entire inside of the frame "tray," with 3-inch gaps between boards. Boards should fit horizontally across the frame. Cut the boards to fit, or ask a home improvement store representative to cut them for you. Wear safety goggles if cutting wood yourself. Purchase two additional 2x4 boards to attach to the underside of the slat structure, so the 2x4s run from the head to the foot of the bed, equally spaced from the center and away from the sides. Attach the pieces to the slats with wood screws.